I’ve been so busy Christmas shopping (read: hunting down Black Series figures) lately that I haven’t had much time for Lego! So tonight I tried putting together some heavy-weapons stormtroopers for my growing Empire. If you saw the Clone Wars Micro Series from 2003 then this guy might look familiar. Or if you’re playing Star Wars Commander on your phone, it was updated with Rogue One content and there’s a heavy Scariff Stormtrooper who also wields this. . .well, rather unwieldy weapon. Seriously, this guy is a one-man artillery unit. I really like how the ‘droid arm’ pieces overlap the shoulders, but the helmet definitely doesn’t fit with those in place. So yes, he’s a little taller than he should be. I put a 1×1 round stud in the helmet just to make sure it would actually attach to the head. You can see the almost perfect angle a bit better down below. Another throwback of sorts, I armed two other troopers with matching Z-6 rotary blaster-style weapons. The technic piece on the end of the blaster gives the effect of having multiple spinning barrels, and the gas pump handles replicate the hand grips needed to handle such a weapon. And what would all this firepower be without someone to tell you what to point it at? This artillery spotter directs the big guns straight at the waves of the Emperor’s enemies. He’s made using all the pieces of a heavy combat driver minus the face, which I swapped out to make another custom figure. Leave me a comment if you like these weapons, or if you have any feedback at all! 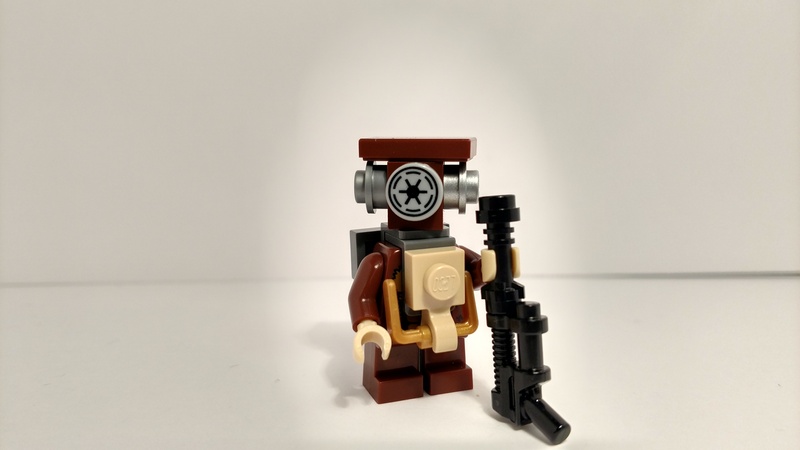 I’ll be trying to do more Lego posts and I’ll undoubtedly be picking up some more Rogue One sets once the movie comes out and I want everything I saw (even more so because I want them all already!) Thanks for reading!